Why is 'Q' always followed by 'U' ? Here we are using a pair of letters to represent a single sound /cue/ which may seem redundant.Such words are called Digraphs. But if you want to blame someone for this redundancy, well you have to blame a whole bunch of ancestors of our English language. Nah!, Just Kidding !It all started in the 11th century. So, Why did the French people have 'QU' in their language? That is because, Latin had it. Latin uses 'C' for 'K' sounds. But when there is 'KW', it uses 'Q'. And, as, French has descended from Latin, they borrowed the 'Q'. || Do you know that there is a theory, according to which Q,U are symbolic representations of Romeo and Juliet and so, they should always be together? How did the Latin get it? From here the story starts to get tricky. But its the opinion of the majority that the two different sounds for representing /k/ sound in Latin came from Phoenicians (present day Greece and parts of Arabic countries of Asia and Africa). The Greeks had two symbols to represent the /ka/ sound, Kappa (Κ,κ) and Koppa (Ϙ). Koppa (or Qoppa) was used for /k/, whenever it is succeeded by 'u' or 'o'. So, this Koppa was most likely the ancestor of our present day 'Q'. In fact, if you see, the symbol for Koppa is very similar to that of Q, one more evidence to support the theory. Also, the Arab countries of Asia have a hard guttural /k/ sound as in Iraq or Qat, which is also considered by some as the origin for Koppa and so, in a way for 'Q' as well. So, there you go. 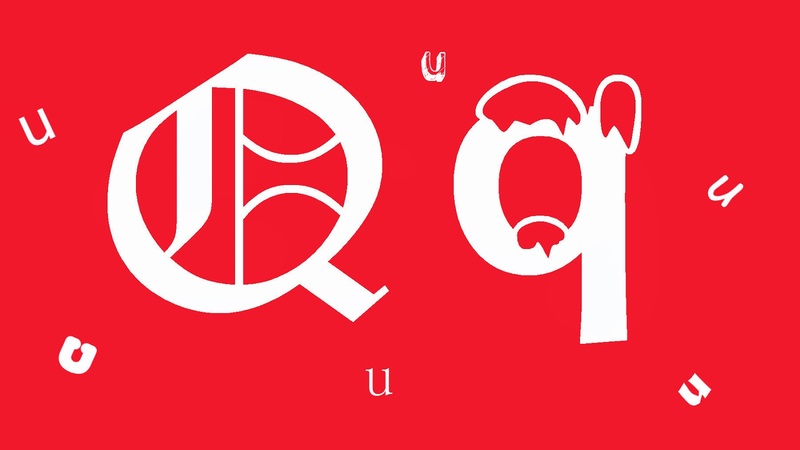 The letter 'Q', as we now know came from Arabic through Phoenician, Latin, French and finally to English. So, it traveled a long way before it came in to English. It also shows us how diversified this world is. We keep putting ourselves in the closets of our countries, religions and teams, but these kind of examples show us that we have a lot more in common than we think. So, Give respect , Get respect and as always, HAPPY READING ! !